For a fun change, try a raspberry caipirinha. This quick cocktail recipe has everything that's great about the original caipirinha, it simply replaces the lime with fresh raspberries. It's a delicious way to enjoy berry season and so easy to mix up that anyone can do it! Just like any caipirinha, cachaça is the liquor of choice for this recipe. It is often thought of as Brazil's version of rum, but instead of distilling the spirit from molasses, cachaça is made from pure sugar cane juice. It's not as sweet as rum and pairs perfectly with fresh fruits, which is why the caipirinha is such a popular drink. Place the raspberries and lime juice into an old-fashioned glass and sprinkle with the sugar. Fill the glass with ice, then add the cachaça. Stir well and garnish with a raspberry. Cachaça is becoming easier to find as exports increase. Explore various brands, but be aware that a top-shelf cachaça always produces a better caipirinha because there's nothing in the drink to mask any impurities in the spirit. The original caipirinha is made with between 1/2 teaspoon and 2 teaspoons of sugar, according to taste. The lime in that recipe definitely needs a little extra sweetness. The raspberries in this version are naturally sweet, so you won't need quite as much sugar. However, do add a little more if you want the drink a little sweeter. While the caipirinha is most often stirred, you can shake it. To do so, secure a mixing tin over top of the serving glass and give it a quick shake up and down (do not tilt it like a cocktail shaker) while holding onto both vessels. This doesn't work for every glass because some old-fashioned glasses don't have a wide enough rim to get a tight seal with the tin. Do a test with water before trying this method so you don't spill your drink everywhere. The other option is to make the drink in a cocktail shaker, shake it, then pour the entire contents into your glass. It's not traditional, though, as the caipirinha is typically made directly in the glass. The raspberry caipirinha can also be shaken after muddling and strained into a cocktail glass for a refreshing raspberry-flavored caipirini. Add more fruits to the muddle for extra flavor. Other berries like blackberries, blueberries, and strawberries are excellent choices, though you can also toss in a few lime wedges. Ramp up the raspberry flavor by pouring half a shot of raspberry liqueur (e.g., Chambord). Raspberry-flavored vodka or rum can also give it a nice kick. How Strong Is a Raspberry Caipirinha? Like the whiskey old-fashioned, when making a caipirinha you're essentially just dressing up a straight shot of liquor and diluting it a bit with ice. That means this is not a light drink and its alcohol content will be slightly lower than the liquor you pour. 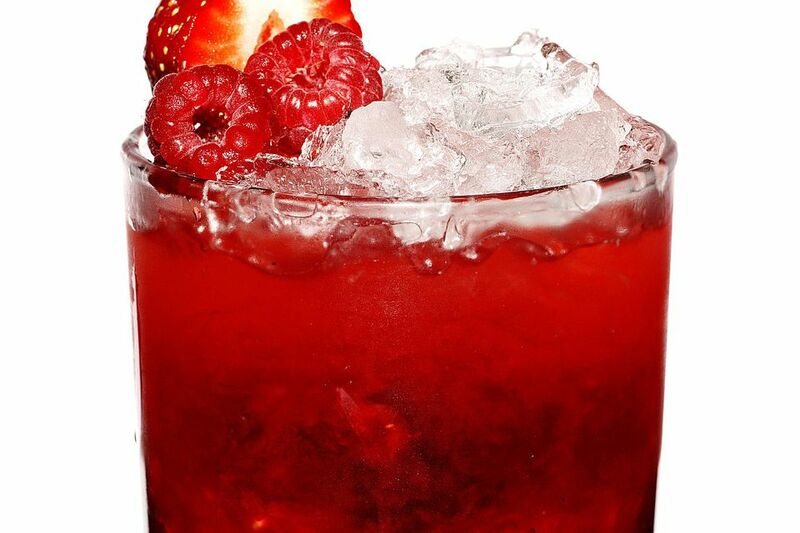 Generally, with an 80-proof cachaça, the raspberry caipirinha will weigh in around 29 percent ABV (58 proof).